Featuring a space to honour artisans and craft villages, an exhibition on the Nguyen Dinh Chieu pedestrian street by Huong River’s side is a highlight of the event. It is showcasing notable products and technical know-how to the public and offering visitors a chance to make traditional crafts themselves under artisans’ guide. On display are products from a wide range of crafts, including embroidery, pottery, wood carving, and conical hat and paper flower making. For the first time, some craft villages located miles away from Hue have also send their products to the festival, including Mai Chau weaving and Dong Ho painting villages from the north as well as a rug-making and pottery village in Binh Ninh communes from the Mekong Delta province of Vinh Long. Thirty-four artisans from Japan, China and the Republic of Korea are also taking part in the event. 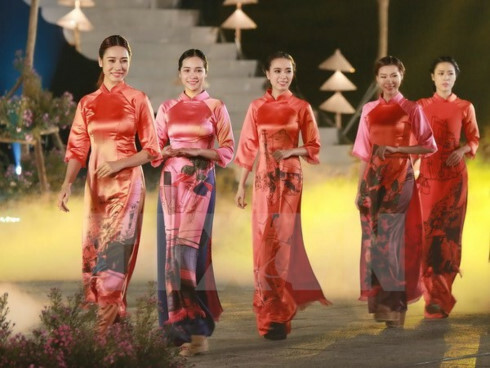 As part of the craft festival, a fashion show featuring the traditional Ao Dai (long dress) took place on the Trang Tien Bridge and Le Loi Street on April 30, drawing significant attention from locals and tourists.